On Monday, March 11th, BTU, MSEA and educators, parents and students throughout the entire state of Maryland will rally in Annapolis in front of the State House to fight for funding for our schools. As one, we are seeking better pay for educators, more school staff, including counselors and psychologists. Universal pre-kindergarten and expanded career technical education. Adequate and equitable funding for all of our schools. Our legislators in Annapolis need to hear from us if we’re going to be able to give you, our educators, and our students the support they deserve. 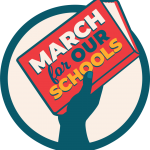 The BTU will be taking buses to Annapolis for the March for Our Schools Rally. Registration is open TODAY, so please reserve your seat early as we are planning on taking many members to represent the Baltimore Teachers Union and our children in Baltimore City. As a lead up to the March for our Schools Rally, we are asking all of our members to participate in #RedFridays, where we will wear red in solidarity with our brothers and sisters in education around the state for better funding for our schools. This will culminate at our the March for our Schools Rally on Monday,March 11th, where everyone around the state will rally in our #RedforEd. Registration is NOW OPEN! Click here to reserve your seat​. Contact: Candance Greene, at cgreene@baltu.org, for more information.